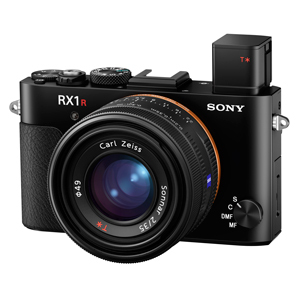 The full-frame 42.4-megapixel Exmor R CMOS sensor present in the DSC-RX1R II works with the BIONZ X image processor to offer high-resolution stills and video while minimizing noise and improving speed. This sensor structure works with gapless on-chip lens design and an anti-reflection coating, as well as eliminating the optical low-pass filter, to improve light collection and enhance detail. Also, the copper wiring layer dramatically improves data transmission speed for creating high-resolution 42.4-megapixel stills at sensitivities up to ISO 102,400. The world's first variable optical low-pass filter allows users to control the amount of filtration they need for each specific image as they work, in order to maximize detail from the 42.4-megapixel sensor. The system uses a liquid crystal layer which it applies voltage to in order to control the light-splitting function. Users will have access to three settings: Off, Standard, and Hi. This unique ability allows the RX1R II to work in a variety of circumstances that normally would require separate cameras. Additionally, a low-pass filter bracketing function is available for users to quickly compare the differences between the different modes. Equipped with a fixed Zeiss Sonnar T* 35mm f/2 lens, the RX1R II can deliver sharp imagery with exceptional control over depth-of-field. The maximum aperture of f/2 can enable shallow depth-of-field as well as benefit image quality in low-light conditions. Ensuring maximum image quality the 8 element 7 group optical construction utilizes three aspherical elements, including 1 advanced aspherical, that minimize aberrations and distortion. The nine-blade diaphragm furthers the overall quality by providing smooth out-of-focus areas in your imagery. This lens also offers a dedicated macro mode that shortens the minimum focus distance from 11.8" to just 7.9". Lock onto your subjects quickly and without hesitation thanks to the revamped Fast Hybrid AF packed into the RX1R II. It uses 399 on-sensor phase-detect AF points with 45% coverage along with 25 contrast-detect AF points in order to improve the speed, accuracy and tracking performance of the system. Faster readout thanks to the back-illuminated sensor structure also allows for tracking while shooting at the top continuous shooting rate of 5 fps. This can be captured with a continuous AF Display that allows users to view the active AF points. In addition to impressive stills, the RX1R II offers some excellent video recording capabilities thanks to the implementation of the XAVC S format in this model. This enables detailed high-bit rate footage to be captured in Full HD 1080p at 50 Mbps at up to 60 fps. This also works with HD 720p recording at 120 fps for slow motion video. In addition this the camera does feature a 3.5mm mic input jack that allows users to connect their standard microphones for improved audio quality. With a high 1,228.8k-dot resolution, the LCD screen will provide shooters with an excellent screen for composing images, adjusting settings, and reviewing video and photos. It also tilts upward 109° and downward 41° for working with multiple shooting angles. Also, it has been designed to handle bright sunlight that would wash out most screens. With its 4-lens optical system using two glass molded aspherical elements, the high resolution 0.39" 2.36M-dot XGA OLED viewfinder faithfully displays what will appear in your recording, including the effects of your camera settings. Also, you will be able to easily pop it up out of the camera body when you want to use it and put it away for storage. The viewfinder will allow users to enjoy rich tonal gradations and improved contrast with high-end features like 100% frame coverage and a 0.74x magnification that enable comfortable and stable eye-level composition. After listening to feedback from photographers, Sony has introduced an uncompressed 14-bit RAW format option for users who demand the best image quality the camera can deliver. This format ensures finer tonal gradations that will not show any artifacts normally found in compressed formats. Still sporting a magnesium alloy construction, the overall design and layout of the camera has been refined rather than completely changed. In addition to the pop-up viewfinder and tilting EVF, the cameras multiple dials and buttons have gotten a facelift for more comfortable handling and control. The lens also features the same physical focusing ring and aperture dial as its predecessor, granting users advanced tactile control over their settings if desired. Built-in Wi-Fi connectivity enables the RX1R II to instantly share imagery to mobile devices for direct sharing online to social networking, via email, and to cloud storage sites. NFC (Near Field Communication) is also supported, which allows for one-touch connection between the camera and compatible mobile devices; no complex set-up is required. Once connected, the linked mobile device can also display a live view image on its screen and remotely control the camera's shutter. Multiple aspect ratio support enables the use of 4:3 and 1:1 in addition to the standard 3:2 and 16:9 options. Also, thanks to the high-resolution sensor, images in the 16:9, 4:3, and 1:1 ratio still manage to offer 36, 38, and 28 megapixels, respectively. A Multi-Interface Shoe located on the top of the camera enables support for a variety of accessories, including remotes, flashes, microphones, and more. Capture One Express (for Sony) is a free downloadable RAW conversion software that will help users get the utmost quality from their image files. Precise white balance adjustments for tuning the exact color using amber-blue and green-magenta axes. Bright Monitoring boosts image brightness by changing shutter speed for better preview of a night sky or dark scene. ISO Auto Minimum Shutter Speed allows users to prevent image blur by setting a minimum shutter speed that when reached will then start changing the ISO sensitivity. Thirteen Creative Styles, including Vivid and Portrait, are available for capturing images with pre-defined looks that can flatter specific subject matter. A 1200-zone evaluative metering system ensures balanced exposures and can be set between Multi Pattern, Center Weighted, and Spot metering. 2x Clear Image Zoom can be used to effectively double the magnification afforded by any lens in use with minimal image degradation. For even greater magnification, 1.4x and 2x Smart zoom is available, as well as 4x, 6.2 and 8x digital zoom.